Rumors after rumors. 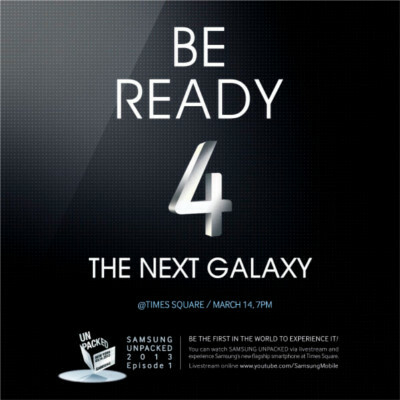 Finally, it is certain the long-waited Galaxy S4 will be unveiled in the Time Square on March 14 (less than 2 weeks away). Will Galaxy S4 be the best selling smartphone in 2013 as S3 did in 2012? Will Galaxy S4 give us surprises? On March 14, we will probably know the answers! The competition in high-end smartphone market is fierce. iPhone 5, HTC One, Sony Xperia Z, ASUS PadFone Infinity, LG Optimus G, HTC Butterfly, ….are all lined up to hold their feet in this most profitable, and also most crowded, market. The momentum of S3 dies down. Recent reports indicated Galaxy S3 was toppled by iPhone 5 and iPhone 4s in Q4 2012, although it still tops Android phone sales. So, it is a crucial release for Samsung. This market is so dynamic. Any errors may be a disaster. Black Berry is still struggling with Z10. HTC is trying to stop bleeding. Galaxy S3’s success is mainly due to better user experience; rather than the hardware specifications. Of course, Samsung’s marketing muscle also plays a role. The importance of user experience (usually linked to software implementation) can never be overlooked. Spectacular hardware specification may attract some eyeballs. But it is the user experience that converts patrons to buyers. If we take iPhone as an example, you may notice the hardware specifications in iPhones are close to most middle range Android phones. But Apple is able to convince fruit fanbois to pay high premiums. It is not just because of marketing. Will Galaxy S4 use Super AMOLED or SoLux Display? Why it matters? According to the latest rumors of the coming Galaxy S4 (from SamMobile), S4 will use SoLux display instead of its own flagship AMOLED. Although, this is very unlikely based on Samsung’s culture, it raised a valid question:why different display technologies matter? Most of the time, when we talk about display, we talk about the resolution, for example nHD (640*360), WVGA (800*480), qHD (960*540), HD (1280*720), and full HD (1920*12980). In other words, the number of pixels in your display is our interest. Higher pixel density means more pixels in the given area, and of course usually results in sharper display. 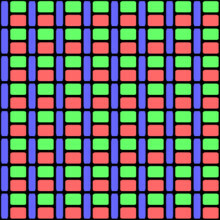 Pixel density usually is measured by pixels per inch (PPI). For your information, Galaxy S has a ppi of 233, S2 with 219ppi and S3 with 306ppi. IPhone 4, 4s and 5 all have a ppi of 326. Usually, when you hold your device 5 to 10 inches away from your eyes, most people cannot differentiate pixel density difference if the pixel density is higher than 300-400ppi. For a handphone, the ideal pixel density is about 300ppi; while for a tablet, around 250ppi is good enough for most users. So, it is safe to say most high-end handphones in the market already have sufficient pixel density for normal users. Galaxy S4 will have a 441ppi display (if rumor is true, and usually is), which is slightly lower than that in HTC One (469ppi). This is far more than enough.